Warning! Sensationalist book title ahoy! I mean Ye Gads! We’re all going to DIE! Yes, but this is about ways to stop dying like right now, this instant! Or at least prematurely and generally due to things you could do something about with surprisingly little effort. 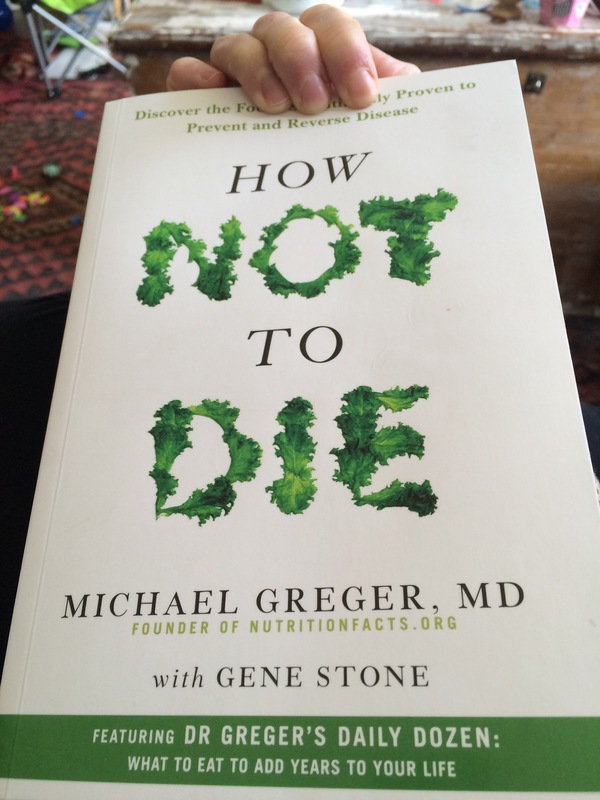 How Not To Die, is a nutrition book, by the Doctor behind NutritionFacts.org and its full of proper science and evidence. Dr Greger looks at the top causes of premature death and explains how lifestyle and nutrition can make the difference between life and death. I first saw this book at my Mother in Laws, and I sat very quietly devouring it, hoping that the small person wouldn’t decide that I needed playing with. And now, months on I have my sticky mitts on it. It’s so good. Like, freaking amazingly interesting, and really practical – no crazy diets or You Must Not Do This! Just stuff you can stealth into your everyday life, and the lives of those around you. And you know how I LOVE stealth. For instance: Did you know that drinking 125ml (half a cup) of beetroot juice 2-3 hours before taking part in a high energy sporting competition can improve performance, while maintaining the same heart rate and reportedly be less exerting than usual?? Who knew that beetroot could do that? Not me, and if anyone out there would like to try it on their next training mission I’d appreciate knowing how it works out for you. Oh! And Broccoli- that oft touted superfood, to get the best out of it and for all the necessary chemical reactions to take place, ideally you need to chop it up 40 minutes or so before you cook it. The resting time allows enzymes and chemicals to dance a merry dance and make it all powerful. However if you forget, and just chop and cook you can replace the enzyme that the heat of cooking kills, by sprinkling it with mustard power. Surely that’s some kind of alchemy? ?